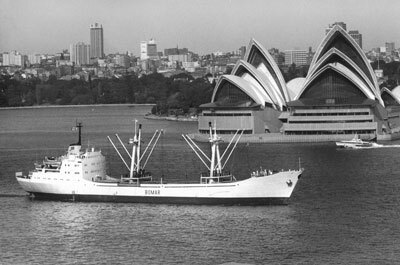 Thank you for visiting sealegacy.com, a name symbolic of my professional service to the International Marine Industry. The year 2010, celebrates forty years since my first professional day onboard a Merchant Ship plying the waters of the North Atlantic, with an eager interest to learn the art of sea navigation. Since my early days of deep sea navigation, the world evolved into more complex marine structures and systems able to entertain the curious and technical mind for decades to come. While sealegacy.com presents a fair number of graphic material to satisfy a curious mind searching for a source of technical wealth, it falls short of a complete picture representative of all my endeavours as a professional maritime consultant. Given my professional responsibility to preserve an atmosphere of privacy and confidence to my clients, numerous projects are kept from public presentation. 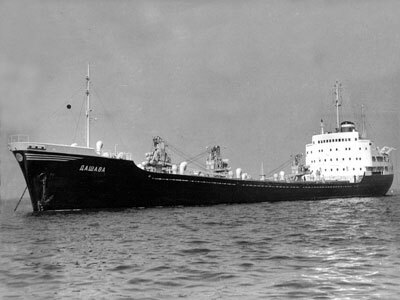 Certainly, my past involvement with State-Flag representation and consultancy together with matters of international rules and regulations, involving ship owner and government clients, formulate a forbidden source for public presentation, yet a great source of information to impress potential client, showing my ability to solve difficult problems. The preservation of honour and professional integrity impose restrictions when business marketing shows a need of exposure to potential clients. 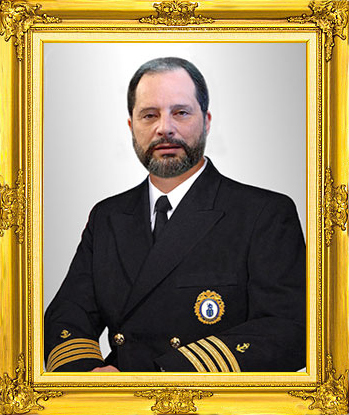 Influenced by individuals of great honour and integrity, my career stayed the course, bringing forth Mr. George Mason (ABS), Mr. Andrew Moore (BV) and Captain Babur Ataman, all honourable members of the global maritime community, as well as my ancestral grandfather, Alvaro Martins Homem, Knight of the Order of Christ, serving the House of Prince Dom Henrique, the Navigator; all exemplifying a wake of excellence with participation in a global society pioneered by my grandfather, along with other Great Navigators that formed the Era of Discoveries. Furthermore, when the topic of historical excellence emerges to accentuate truth and fairness of individuality, it is with great pleasure that I assume the role of researcher. A mannerism, perhaps a dedication that I acquired when Doctor Luciano da Silva entered my life, with an attitude to bring to the surface the overall contribution and truth about the Great Navigators emerging from an empire of knowledge and discovery, Portugal my country of origin. Reflective of an ancestry dating back centuries, my birthplace the City of Angra do Heroísmo, Island of Terceira, Açores, today a museum, selected by UNESCO as a world historical site, preserves a collection of historical splendour emerging from the reality of human behaviour dismissive of an artificial life seen in today’s Western World. Within one of its cathedrals, the remains of several Great navigators, rest in peace with a view overlooking the immense Atlantic Ocean; Alvaro Martins Homem, Paulo da Gama, João Vaz Corte Real, and several other men and women that plied the oceans of the world in times when no other dared to navigate. Purposely, my professional life paralleled an intellectual curiosity to search and learn from the reality of human behaviour, rather than adapt artificial doctrines designed to preserve human decadence, so alive within the various political organizations and masters of the current artificial world that mostly, robs an individual of reality and truth. The world navigator has the unique gift to observe a variety of cultures, with an understanding that political influence is self-induced, rather than a natural influence acquired by observation. The apparent perpetual drive to self destruct, exemplified by numerous world conflicts, some I personally witnessed with no excuse to praise fellow humans, leaves my intellectual curiosity at a stalemate when searching for kindness from fellow humans. My Canadian Veteran status arises from Merchant Navy service within theatres of war rather than an embrace of militarism, an attitude that extends to my business practice where no military styled projects occurred. The struggle to follow a maritime career conducive with a positive contribution to human life, leaves me with reservations that mostly it is in vain, better, my contributions helped create a center of greed and oppression, easily identified by the unevenness of world wealth distribution. 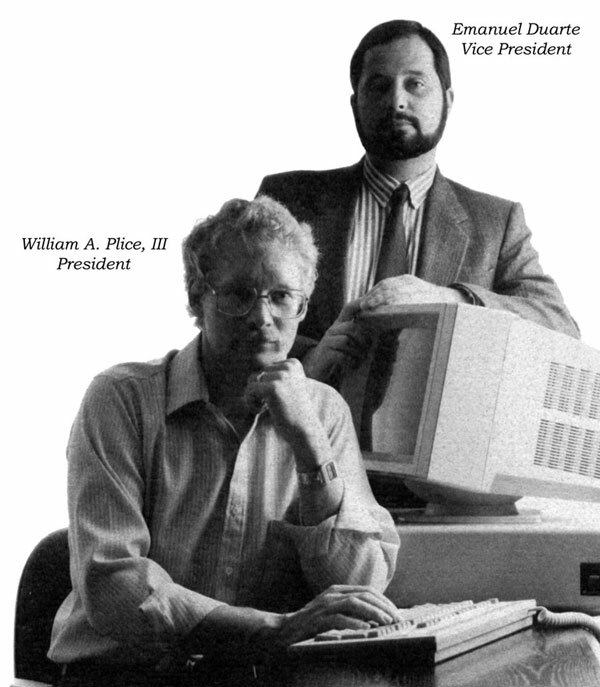 Contemporary love for the computer influenced my career, with an imagination that it was for the better of humankind, beginning with my participation with the likes of William A. Plice III, the originator of GHS and president of Creative Systems, Inc., a company that I helped reorganize following the breakup from AutoShip. 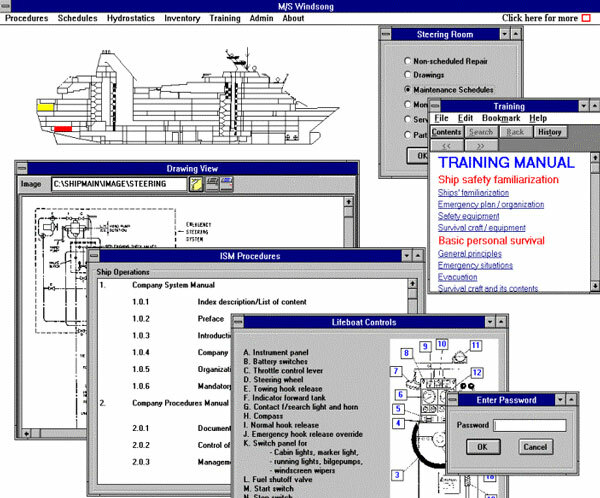 As Vice-President of Creative Systems, Inc., my exposure to sophisticated software programming led to creations of my own, involving ship operations and onboard stability software in association with my old friend, Steven Hollister, president of Newave Systems. Without a doubt, the usage of a computer to accelerate human creations accentuates an impressive intellectual breakthrough, yet with human repercussions. The usage of computers for the production and guidance of weapons and equipment of mass destruction is impressive, yet abusive when significance to the purpose for human life enters the question, indicating a determined desire to suffocate a peaceful coexistence with nature. Today, in a direct contrast to my childhood years, dreaming about a life at sea, I see our youth engulfing themselves in the modern world of computerized gadgets and illegal drugs where dreams of adventure and a natural coexistence are paralysed. Parents, supportive of the new computerized era, insist that their children are an intellectual “cut above” demonstrated by their dedication and ability to use computers. Instead, failing to understand the development of artificial intelligence, an adaptive and resultant of computer science, where the contemporary software user is enticed to use the computer to the heights of addiction and pervasion. Exposing children to this type of indoctrination is a deprivation of intellectual and physical good health. The construction of floating palaces to transport the wealthiest of individuals to the likeness of an artificial god, created to satisfy human decadence, entered my realm of professional naval architect with institutionalized mannerism of race deprivation; those that have and those that will never have. Whenever, a commonly recurring entertainment episode, depicted within a variety of Hollywood styled cinema, showing a “food fight”, it serves as a constant reminder of the many garbage compactors placed onboard the modern floating palaces where the leftover food stock is enough to feed a poor nation. Within cruise ship construction and operations, food wastage insults the very nature of our soul, if one actually exists. A comparative analysis of contemporary life with archived historical data, presents a realistic outlook of human life and perhaps its intended purpose. With so many Western cultures claiming a stressful existence, it is puzzling to witness multitudes of people ignore historical lessons, and commit the same horrendous mistakes, well depicted throughout history. The decadent nature of the human being continues to manifest itself today, as in past centuries, yet with a greater power to destroy. The preservation of the intellectually corrupt emerges as the dominant force that stimulates the masses into decadence and defeat, of the human creature able to perform better. Politicians, academics, religious leaders and minority forces of power, impose a challenge to the masses, with no winners. Parenting a human being into maturity to discover that intellectual ability stalemates, dwelling on absurd concepts of god, as an example, paraphrases the old saying; we know that we don’t know. Moreover, the human failure to grasp the reality of being drives the masses to extreme, with figments of its own creation designed to entertain and retard positive development. Settling down to a conscious clear level realizing that within our genetic parameters all the answers already exist, it is with disappointment that my life fails to entice the masses into a progressive and positive journey of discovery dwelling on factual evidence. Ignoring perplexed theories emerging from political correct organizations could form the start of a journey to a better life followed by a dedication to create a less destructive human world. Obviously, the ultimate challenge, reaching intellectual excellence, is to disprove that humans are genetically designed to destroy and bring forth evidence that produces a change. While the life of a deep sea mariner, maintains an uplifting attitude to refrain from subjugation of human origin, it does not, however, prevent disappointment and embarrassment. Canada, my country of dual citizenship, where a Luso-Canadian identity marks my cultural background, fails me with repeated disappointment and embarrassment. 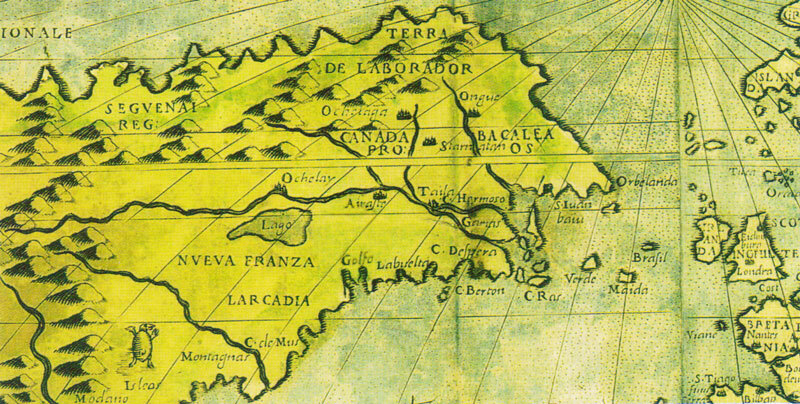 Boundary lines and territorial names are clearly drawn and written on the maps that survived the ages, supporting the undisputed presence of the Portuguese on the formation of Canada before any other European. A decade later the French followed suit, colonizing the territories to the west of the Saguenay River. The characteristic of the Saguenay River, located on the Province of Quebec, Canada, play an important part on the origin of the name canada as applied to the nation’s name, Canada. The river is bordered by steep cliffs that guide its very high water flow to the St. Lawrence River, which, in turn, flows into the Atlantic Ocean. Historically, the Saguenay River was an important trade route into the interior of the Province for local native people and later, during the French colonization of the Americas; the river was a major route for the fur trade. Located on the shores of the river, Tadoussac is France's first trading post in Canada, established in 1600. The river takes its name from the legendary Kingdom of Saguenay. The modern definition of the Portuguese word canada; simply means passage, corridor, narrow road and, for centuries, indicates a border mark between two distinct pieces of land or territories to identify limits of ownership. 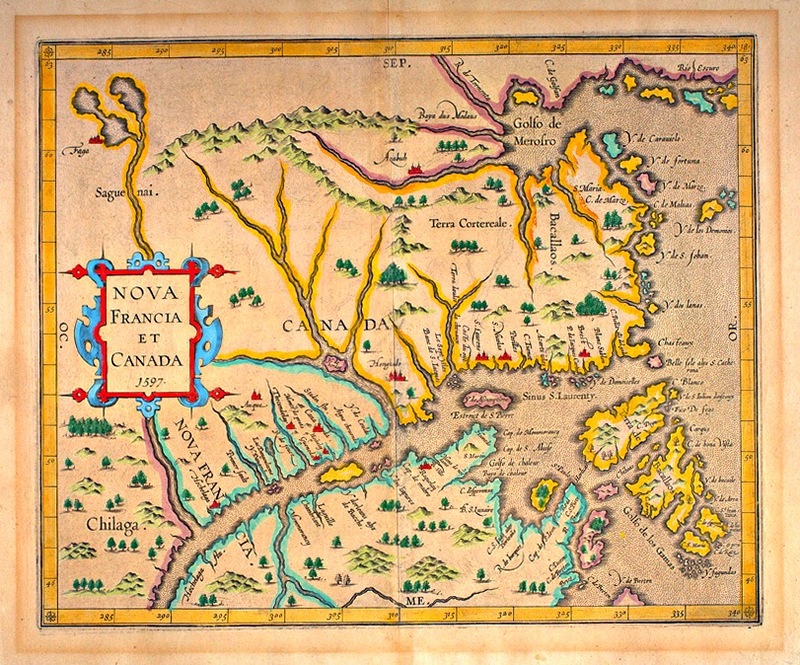 The majority of maps showing the eastern part of Canada, produced during the early fifteen hundred, reaching mid seventeen hundred, display the word canada directly over the area of the Saguenay River, a dividing line between the territories belonging to the Portuguese Crown and French settlements that followed, accentuating the boundary between two distinct ownerships, Portugal and France. 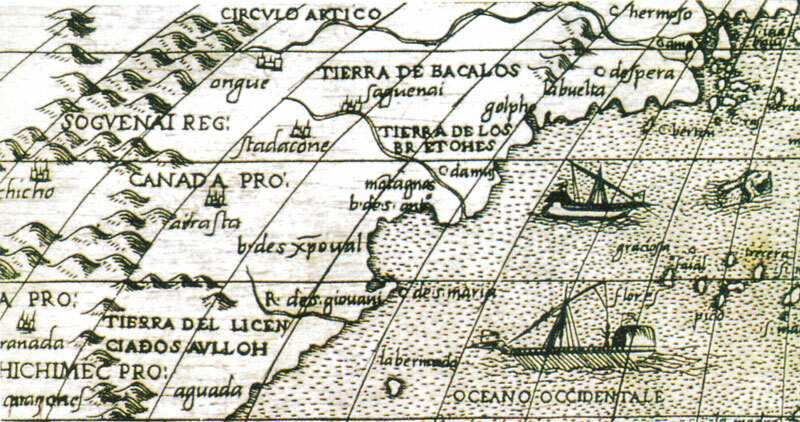 Furthermore, the map produced by Paolo Forlani sometime in 1566, two words canada pro are shown, asserting that French territorial is beyond the canada, better said, beyond the water passage. The Portuguese word canada maintains its usage today with as much frequency as it was in the fourteen and fifteen hundreds. For example, various streets near the house that I was born begin with the word canada, specifically, Canada Nova, Canada dos Filadais, Canada do Mato and many more, all located within the limits of the City of Angra do Heroismo. Unfortunately, simple evidence based on early maps of Canada about the origin of word canada are not enough to satisfy English speaking Canadian historians and academics that insist the nation’s name derives from the word kanata, a native Mohawk word, meaning “village” or “settlement”. Certainly, a mannerism inherited from the Anglo-Saxon mentality that remains deep rooted in Canada, to discredit any Portuguese or Spanish accomplishment. The family of Captain João Vaz Corte Real, originates from the City of Tavira, Province of Algarve, Portugal, where they owned a vast quantity of land. The word canada has its origin from within their property, a name given to a small stream covered with canas, a type of bamboo stick available to southern Portugal. From its origin, the word expanded to its modern version, as above-mentioned; passage, corridor or narrow road. Creative lies, emerging from the Anglo-Saxon mindset, in this case to dismiss Portuguese participation about the discovery of Canada, only accomplishes ridicule on themselves; effectively, an issue worth dismissing given present day British culture and how it impacts the world. Whether the world at large cares or dismisses British culture, it is largely a topic of entertainment. Dismissing this type of historical fact is an embarrassment, yet not a danger to public safety, unlike the Canadian Ministry of Transport and segments of the Royal Canadian Mounted Police that choose to pursue incompetence and criminal activity rather than safeguard human life as per their mandate. My opinion, based on evidence; dictates that Canada is a "Remnant of the British Empire". A status imposed by the majority of Canadian society. I have absolutely no reservations about showing praise for individual Canadians that continue to bring honour and integrity to Canadian shores. Within the International Marine Industry a high number of Canadians serving such, continues with pride and integrity for professional excellence. The embarrassment and ridicule arrives when a professional individual examines the high level of incompetency within the Canadian Government. Within a slew of stability booklets placed onboard commercial vessels flying the Canadian Flag, as per the Canada Shipping Act requirement, several that I examined fail to meet Canada Shipping Act criterion, some as my conversation with the Crown entailed, were created by naval architects that should choose a different profession, given their lack of knowledge on being a naval architect. These particular booklets give no indication of vessel’s stability, where no righting arms are calculated and even the basic GM is questionable. Therefore, I asked the Crown Prosecutor whether or not the questionable naval architects merit prosecution. His answer was swift and sure, saying that a naval architect without proper credentials was beyond prosecution. Without a reply, I proceeded to ask a second question; should a grossly incompetent Canadian Steamship Inspector avoid prosecution when he or she stamps the useless booklet in approval? Today, I remain without an answer. As the years pass, the world of the moral irresponsible entertains the masses into oblivion, while the destitute few comprehend nothing. Yet, for those that accept the challenges that life gives, they have a simple but powerful consolation, life is short, don’t sweat the little things. Once again, bringing forth my unforeseen circumstances, when I came face to face with a series of incompetent Canadian Steamship inspectors, relating to an unseaworthy vessel, it was Canada’s neighbour to the South, the United States of America, Homeland Security that thanked me, in writing, for my efforts to safeguard human life, not Canada. Today, I hold a series of documentary evidence alleging criminal wrongdoing originating from members of Transport Canada and one member of the RCMP, yet the Canadian Judicial system continues its mandate to protect civil servants from facing criminal prosecution, certainly a waste of taxpayer’s money. 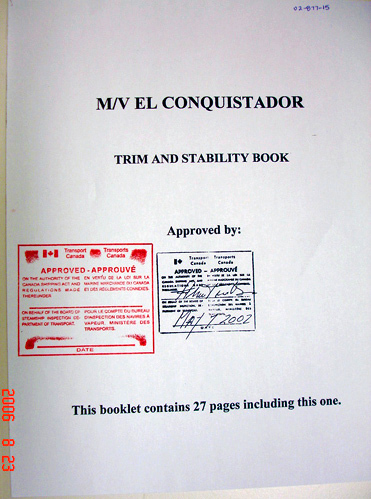 The document depicted below was obtained from honorable members of the Royal Canadian Mounted Police, showing a transport Canada official stamp placed on a falsified copy of a stability book that I produced to show the vessel owner that his vessel was unseaworthy. Today, the following questions are unanswered: Why an official Transport Canada stamp was stamped by Canadian officials on a falsified stability book? Why Transport Canada allowed an unseaworthy vessel to depart Canada endangering the lives of Canadians? These WebPages satisfy my need to consult the human world with thoughts and experiences. The internet, without a doubt, has changed many aspect of human communication and socializing, unfortunately human decadence accompanies any well intended innovation. I am satisfied with the twenty five (25%) or less percentage of good to excellent services the World Wide Web (W.W.W.) brought me; worldwide communications, a simple way to connect with institutions of scientific data, simplified methods to promote business and publish material that bring forth truth. Ending these introductory series of paragraphs, I would like to quote Sandi and Danny, a missionary couple that for several years, volunteered their services onboard a hospital ship caring for the ignored, poor souls, of the world. Their strong message reflects a mannerism entrenched in today’s Western World.